Lucky is a nine year old shih zhu mix who is looking for a special retirement home where he can lay his head. Lucky is blind, and he has also been going through heartworm treatment. His adoptive home will need to be willing to keep him up on heartworm preventative every month for the rest of his life. Lucky will do best in a quieter home, with kids 10 and up who are willing to give him space. He will need to be groomed every 5-6 weeks or so, which will cost around $50-$60 per trip. Lucky will need a patient family who is willing to work on some housetraining with him. He was just neutered, but he will also need some time to gain an understanding of any new place that he goes to because he cannot see. His foster has been using belly bands with him, and this is a great option too. Lucky has been neutered and had a dental cleaning. He is up to date on vaccinations and microchipped. Lucky is the sweetest boy and deserves to be spoiled and loved on for the rest of his years. 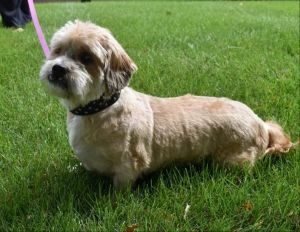 Lucky will not be at our adoption event on Saturday so please contact his foster to learn more!